Status: Common regular spring and fall migrant statewide. Common regular breeder statewide. Rare casual resident statewide (in mild winters). Common to rare regular winter visitor statewide (rare in severe winters). Documentation: Specimen: UNSM ZM6281, 6 Jul 1892 Lincoln, Lancaster Co.
Taxonomy: Nine subspecies are recognized, four occurring south of the US and five from Texas northward (Pyle 1997). The latter five subspecies are separated into two subspecies groups, “red-shafted” and “yellow-shafted”. The three “red-shafted” subspecies are cafer of coastal Alaska to northern California, collaris of the southwestern USA, east to southwest Saskatchewan and south to Texas, and nanus of west Texas to northeast Mexico. The “yellow-shafted” group consists of luteus (includes borealis) from central Alaska to eastern Canada, south to the northern edge of the USA, and auratus of the southeast USA, south of luteus, and west to eastern North and South Dakota, the eastern half of Nebraska, and most of Kansas and Oklahoma (mapped in National Geographic Birds of North America, 6th Edition). West of the range of auratus is a wide intergradation zone where “yellow-shafted” auratus and “red-shafted” collaris meet. The center of the intergradation zone, which has been stable in position and width since the late 19th century (Wiebe and Moore 2017) and is relatively young, only 4000-7500 years (but possibly older) and since the Last Glacial Maximum (Wiebe and Moore 2017), passes from the Black Hills of South Dakota southward through Chadron to near Crook in northeast Colorado (Short 1961). There are probably no “pure” collaris in Nebraska in summer (Short 1961), and possibly only very few “pure” auratus in extreme eastern Nebraska, with most summer birds being intergrades (Short 1961); few parental types occur within the rather wide intergradation zone, where mating is random (Sibley and Monroe 1990). In winter, most birds in western Nebraska are at least “salmon-colored” (Rosche 1994), with some occurring east to the Missouri River; perhaps some fairly pure collaris appear also in the west (Andrews and Righter 1992), although all collected specimens are intergrades (Rapp et al 1958). Many migrants and wintering birds are northern “yellow-shafted” birds that show very little intermediate character (Andrews and Righter 1992). Two birds labeled borealis (=luteus) in the Hastings Municipal Museum (HMM 26960) were collected in Adams Co 9 Feb 1951. An interesting phenomenon occurring in several species, including Northern Flicker far east of the known hybrid zone, is reddening of primarily yellow feathers due to rhodoxanthin, “a rare carotenoid pigment of deep red hue” (Hudon and Mulvihill 2017). There is no apparent genetic cause of this increase in red pigment, but it is attributed to ingestion of the berries of two exotic shrubs, one of which, Tatarian honeysuckle (Lonicera tatarica), occurs in Nebraska (Hudon and Mulvihill 2017, Thomas Labedz, personal communication). In Nebraska this effect would be difficult to discern in winter as Northern (Red-shafted) Flickers occur over most of the state at that time, but any summer report of such birds might be attributable to Tatarian honeysuckle berry ingestion. Later dates for “red-shafted” flicker in the east-central and east are of 6 on 23 Apr 2016 Douglas Co, 3 May 2008 Knox Co, 13 May 2017 Hall Co, 16 May 2017 Brown Co, 17 May 2017 Buffalo Co, and two on 6 Jun 2017 in Brown Co. The above dates are for birds with red shafts; later dates in the east without details are most likely paler shades, often referred to as “salmon-shafted”. Peak migration of the species occurs in late Mar-early Apr; most migrating flickers in Nebraska are returning Canadian and Northern US breeders that migrated southeastward through Nebraska during the previous fall. They are “yellow-shafted” birds of the subspecies luteus. The easiest migrants to discern, other than flocks of migrating northern “yellow-shafted” flickers, are “red-shafted” flickers; these vary from dark “red-shafted” to shades merging into darker “salmon-shafted” and are birds that moved eastward and southeastward into Nebraska during winter and are returning to their breeding ranges north and west of Nebraska. These “red-shafted” flickers do not breed in Nebraska. High counts: 50 at Fort Kearny SRA, Buffalo Co 15 May 2018, 40-50 in Lincoln Co 27 Mar 2004, 42 at Lincoln Saline Wetlands Nature Park, Lancaster Co 13 Apr 2018, and 40 at Fort Kearny SRA, 19 Apr 2001. A high count of “red-shafted” flickers was 10 at Potmesil Ranch, Sheridan Co 10 Apr 2009. 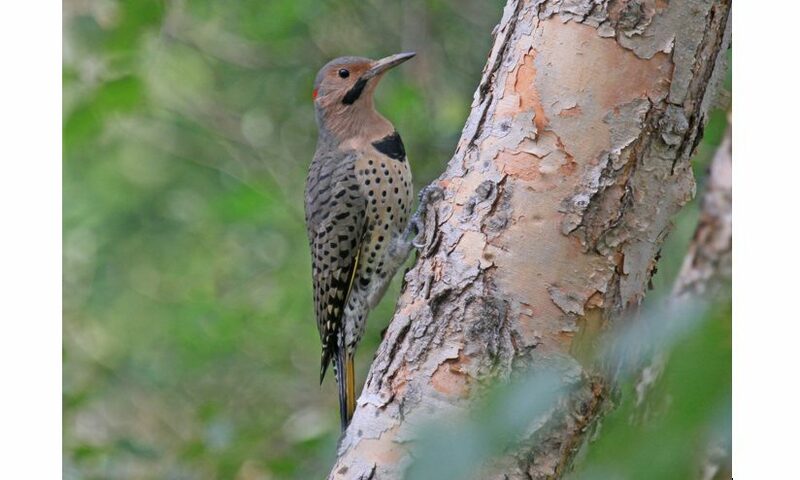 Summer: Breeding “yellow-shafted” flickers occur statewide, although numbers are somewhat lower in the Panhandle, except for the Pine Ridge (Rosche 1982), and over large areas of the Sandhills where suitable habitat is restricted. “Red-shafted” flickers do not breed in Nebraska, South Dakota, or Kansas (Tallman et al 2002; Thompson et al 2011). In South Dakota, no pure “red-shafted flickers” were found among 511 breeding specimens collected mostly in western South Dakota (Tallman et al 2002). There are numerous late May- early Aug reports of “red-shafted” flickers in the west-central and Panhandle, few with details, although one in Morrill Co 21 Jun 2016 was well described. It is likely that most of these summer reports are of intergrades showing near-red shafts. Peak migration occurs in late Sep and Oct; as in spring, northern breeders from Canada and states north of Nebraska are conspicuous migrants. An earlier date for the east was of one in Sarpy Co 2 Sep 2017. Most migrant “yellow-shafted” flickers migrate through eastern Nebraska (see below), where they may not be readily identified amongst local breeders, but arrival of migrant “yellow-shafted” birds in the Panhandle is easily discernible and occurs by late Sep; singles were at Bridgeport, Morrill Co 15 Sep 2012, West Lawn Cemetery, Gering, Scottsbluff Co 21 Sep 2002, and James Ranch, Dawes Co 25 Sep 1995. Interestingly, the composition of high fall counts in the west (see High Counts) shows few “yellow-shafted” flickers in mid-Oct, suggesting that they migrate south primarily through eastern Nebraska. As Wiebe and Moore (2017) state: “banding recovery records show that northern populations of Yellow-shafted Flickers are strongly migratory, funneling into se. U.S. in late autumn”. The preponderance of “red-shafted” and intermediate birds in the western High Counts suggests an influx of migrants from further north in the hybrid zone supplemented by “red-shafted” flickers from further west. According to Wiebe and Moore (2017), “Breeders from … n. Great Plains (to include most of the northern hybrid-zone populations) migrate south-southeast, predominantly into e. Texas and Oklahoma.” There is a significant eastward movement of “red-shafted” flickers in fall, apparently a continuation of altitudinal movement out of the mountains (Bent 1939), and another example of “altitudinal” migration in Nebraska (see Mountain Bluebird). High counts: 270 over Omaha, Douglas Co 7 Oct 2015 (flew over for five hours), 73 at Lake McConaughy, Keith Co 12 Oct 2000 (47 “red-shafted”, 9 “yellow-shafted”, 17 intermediate), 50+ at Red Willow Reservoir, Frontier Co 3 Oct 1998, 50 in Garfield Co 7 Sep 2015, and 49 at Oliver Reservoir, Kimball Co 11 Oct 2000 (41 “red-shafted, 2 “yellow-shafted”, 6 intermediate). Winter: CBC data indicate a generally even winter distribution statewide, with somewhat lower numbers in the north and west. The distribution of “red-shafted” flickers on CBCs is strongly-biased to the west; recent CBC data show that almost all flickers in the west are “red-shafted” or intermediate, and in the east only about 3% are “red-shafted”. Photograph (top) of a Northern Flicker at Papillion, Sarpy Co 13 Sep 2012 by Phil Swanson. Sibley, C.G., and B.L. Monroe, Jr. 1990. Distribution and taxonomy of birds of the world. Yale University Press, New Haven, Connecticut, USA and London, England. Wiebe, K.L., and W.S. Moore. 2017. Northern Flicker (Colaptes auratus), version 2.1. In The Birds of North America (A. F. Poole and F. B. Gill, Editors). Cornell Lab of Ornithology, Ithaca, New York, USA. https://doi.org/10.2173/bna.norfli.02.1.